So, as I mentioned before, I have signed up to run 100 miles during the month of September (not all in one go!). More of a challenge than July, as I am at work so no chance of a longer run midweek to make up the miles. I had worked it out roughly as four runs per week, 3 of five miles, and 1x 10 miles. But I got behind as coming back after my holiday I eased in a bit gently, doing less than 5 on the shorter runs, and only a 6 for the first long run. Tuesday– It was so hot! This was at 6.30 (after being in a boiling hot classroom all day- it’s 30C in the coolest bit)- the temperature outside was still 30! We did 4 miles around the lake as it was a bit cooler, and that was far enough for us all. 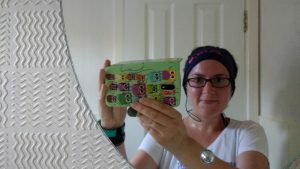 Wednesday- I woke up in the night with an awful headache – I knew I had not had enough to drink after the Tuesday run (a glass of nuun, a cup of tea and a little bit of water), and I ended up being awake for a couple of hours. As we had a meeting and then our club social on Thursday, I had to do my run that day, so I went out for 5 miles. I took it slowly as I was tired from the night before, and I bumped into someone from the club so I chatted to her for a bit. I was dripping when I got home! I think it felt hotter than Tuesday, probably being an hour earlier didn’t help. I made sure I had a lot to drink though, including some coconut water. 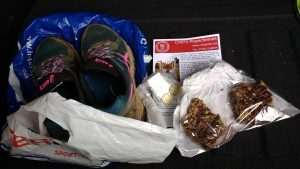 Saturday– I was going to meet my dad at Panshanger parkrun, as I had not been there since before holiday, and they were having a charity cake sale. I got there early and did a couple of miles along one of the tracks, and the hung around at the start, Luckily I had my phone with me, as at around 8.45 my phone rang, with my dad telling me that him and my brother left late (my brother’s alarm didn’t go off) and so they were going to Ellenbrook as they would not get here on time! 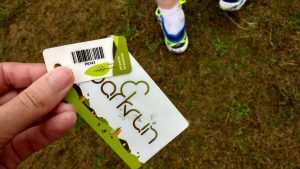 So I did the parkrun, and then as I was in the barcode scanning queue I realised it was around 0.4 miles back to the car, and I had already run 5.4, so if I did a little bit around a field I could make it up to 6. Every mile counts! I bought a couple of these amazing flapjack caramel pecan squares and had a bit of one when I got home- it was delicious. My trail shoes got their first outing of the autumn too. In the afternoon we headed into London as some of my relatives from Austria were visiting, so we had a lovely wander by the Thames, had a Starbucks (it was so cold! ), walked some more, went to some pubs (the rest of my family very much like a beer or three!) and had dinner before wandering back along the Thames in the dark. There was an interesting art instillation- a large cube of drawings made by North Korean refugees, lit up from the inside. At night it really stood out and looked very dramatic. Sunday– Long run. 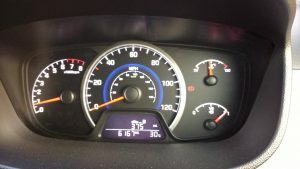 I had to be up early as I was meeting friends at Luton Hoo for “morning coffee” (basically pastries and tea), and Andy was also up early as he was driving down to Southampton. So by 7.30 I was out the door. I had planned on running 10 miles, but as I neared home I felt OK, and still had 10 minutes left of my allotted run time, so I headed around the little mile loop to make it up to 11. After a drink and some pottering (emptying the dishwasher, putting away washing- these things are more useful to life than stretching) I had a shower and even managed to dry my hair for 10 minutes, so it wasn’t completely dripping. Then I could enjoy a lovely catch up. So, I think this week I actually managed the 25 miles, (26 in fact) and now my total for the month is 69. I need to make sure I stick to my plan though otherwise on the final day I am going to be doing a very long run after work indeed! Are you a fan of art? I like it when it is explained, as just looking at something does not often mean much to me- I’m not good at interpreting things. Previous Previous post: A running club celebration! Next Next post: Disneyland Paris half marathon!